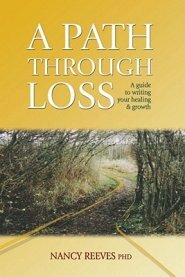 [by: Nancy Reeves; WESTMINSTER JOHN KNOX PRESS – 2001] A loss is any experience we feel restricts us. The process of healing or growing through this restriction is called grief. Grief can come from many sources: divorce or separation, unemployment, a serious injury, abuse, chronic or terminal illness, death, childhood loss due to parental illness or substance abuse, or a life transition such as a career change, a move, or retirement. This self-directed journal-based guide recognizes that grief is a process. Through well-written, practical information, it provides tools for nurturing the physical, emotional, and spiritual aspects of the self. Intended for individual use, it is also a valuable tool for counselors. Includes a section on children and grief.